Every now and then it is nice to look back at a completed project. I recently completed my final spider swarm to finish the first phase of my Ramos crew for Malifaux. 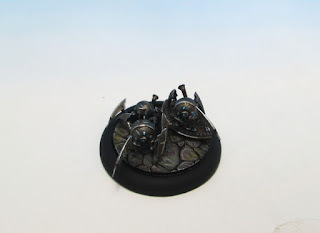 In this post I will share some pictures of the painted Arachnid Swarm and some shots of the completed crew and my thoughts on playing them. 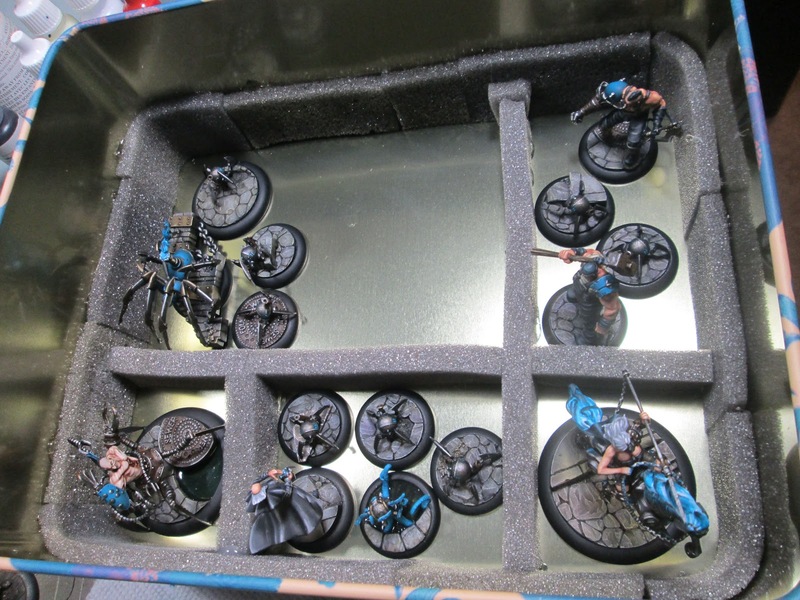 Malifaux has a unique mechanic in that you build your crew once you have found out the opponent and objectives for each game. This is nice because you can avoid many really horrible matchups or imbalances as you can somewhat tailor your crew to the scenario being played. The downside (in some ways) is that it makes having some variety in your collection a bit of an advantage. It's not too painful though, as the models are so nice and the crews are so small that you will probably want a few crews from a faction anyways. My list so far gives me 3 or 4 different ways to build a Ramos list. To date, I have played about 12 games with this Ramos crew. Usually my crew consists of Ramos, Joss, the electric creation, Johan and either the Mechanical Rider or Howard. Howard is great for killing things in the early turns. The Mechanical Rider is great for putting down lots of scheme markers. I use Joss to support the summoned spiders. Johan removes conditions and is a mini beatstick when needed. The last few games I have finally started to get the crew to work. Malifaux is unique in that you have to achieve victory points through the strategies and schemes. It often is a waste of your activations to spend too much time chasing down and killing models. This crew has been a lot of fun to paint. The spiders got a little tedious. All of the other models were a lot of fun to paint. I love that in Malifaux you end up painting lots of unique character models. It adds a bit of pressure but you are never bored of painting 12 of the same model (unless you pick the only crew where you need 12 arachnids...). All of the character models I have painted so far have been wonderful sculpts to paint. They are tough to assemble but wonderful to paint. I've magnetized all of the models. They have so many thin bits it is hard to put them in foam. This has worked well so far. As I mentioned at the start, it is nice to sum up the completion of a mini project. I've really enjoyed playing and painting Malifaux and so this crew represents the start of my collection. I already have my next Arcanist master, Colette, ready to be assembled and painted to expand my collection. Over the next several months I want to paint up the Colette box set, some Metal Gamin (for the Mech Rider to summon) and some December Acolytes. I hope you've enjoyed seeing this first foray into Malifaux models. Come back soon for some painted Perdita models and for some progress on my Colette crew. Thanks for visiting! Those look great, I really like the subtle colors on all of the steam-bots. 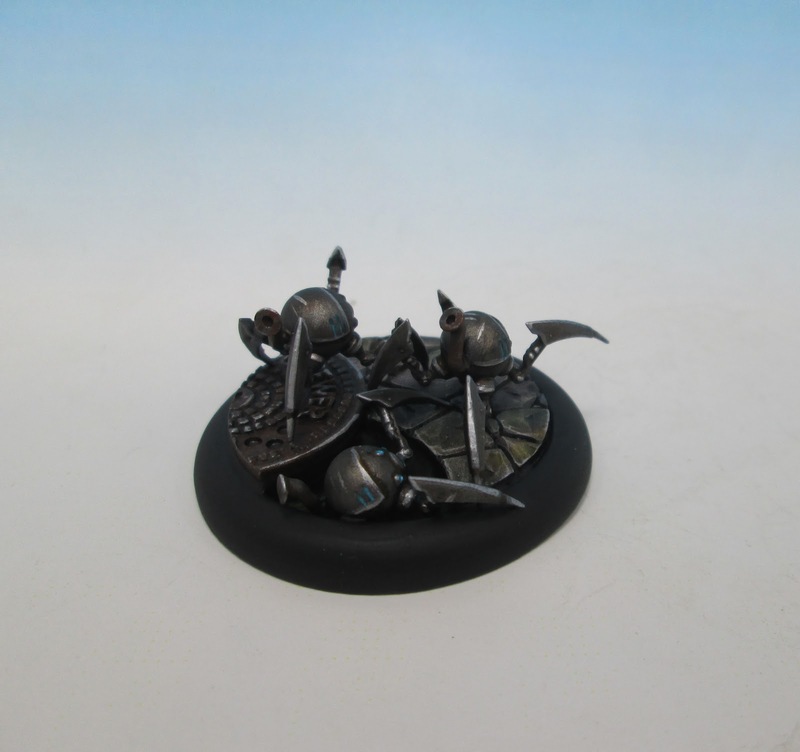 The basing is fantastic as well. 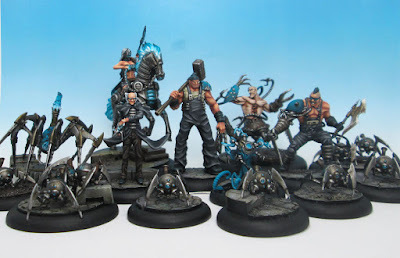 I tried getting into this game about a year ago, the sculpts were so cool and the game mechanics looked very unique, but no one plays in my area so I sold it all off. Thanks Richard. It's a good game and well supported with community events and different products. Luckily there is a small community here to play with. It's definitely a game on the rise from what I see. Am happy to see such great looking finished results Cameron. This is a great project and an aside from your typical FoW action - it's great to see your painting skills at work on non-WW2 sculpts. 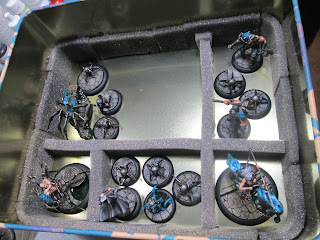 I played Version 1 of Malifaux when it first came out some years ago. Wasn't much of a fan of the rules though. The models that I painted (Old metal Nephalims [I think] boxed-set) were fun though and looked pretty cool. I thought it was a great comment... Ha-ha, I'll take them :-). The new Malifaux sculpts are far nicer, IMO, than the old metals. The rules are much more streamlined now as well. It is nice to paint outside of ww2 as I was stagnating a bit in my ww2 painting. Fantasy allows me to push my colours and techniques a bit more. 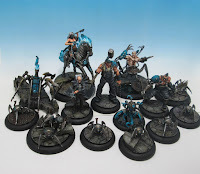 I've just started to get into Malifaux after a couple of friends have been playing for awhile. I'm new to all of it (the game, models, painting, etc). I'm curious about your bases. Did you make those by hand or are they inserts you purchased from somewhere? Thanks for the post and inspiration. Hi, the bases are resin bases from secret weapon miniatures.